When I first made contact with this coach she had loads of forms for me to fill out which included my goals for the year. Taking me up on that she's been remotely watching my rides via Garmin Connect and set a plan, to work on improving my endurance & stamina. So... Getting cocky I suggested last night that my ambition to ride ½SDW was setting my sights a bit low and that I could use it as a training ride and go for the BHF London-Brighton Off Road ride. In the cold light of day I'm now kicking myself a bit, but I reckon it's still very much achieveable. Is anyone else doing it this year? When I first did the Pilgrims Hospice 78 mile road ride, my furthest distance on the road was 48 miles. I had to make special effort to pace myself but I completed the ride. Learning to pacing yourself is the key, and you should be able to do at least 65% of the distance reasonably comfortably. But that was on the road. Off road and you're entering a whole new level of endurance. The following year I did the same PH ride again and then a few months later the Brighton Big Dog - a six hour race in which I entered the solo category. It was much harder than I expected, really tough. I felt sick at one point and had to stop, and almost felt like crying like a big girls blouse. I felt ill after the race too and decided beer at the after party was the last thing I wanted. We went out for dinner to a Greek restaurant for some reason and I couldn't eat it, though to be fair it was minging anyway. Having said that, the BHF L/B off-road isn't a race so it won't be so intense, but yeah, you need to prepare for it... but surely this coach of yours (coaching in fitness, skills or both?) would have warded you off doing so if they didn't think you had a chance. Lol you're really selling it to me there. But like you said, being a ride rather than a race it'll be less intense. Yeah this coach is doing skills & fitness so I'm sure she would have put me off if she didn't think I was capable. 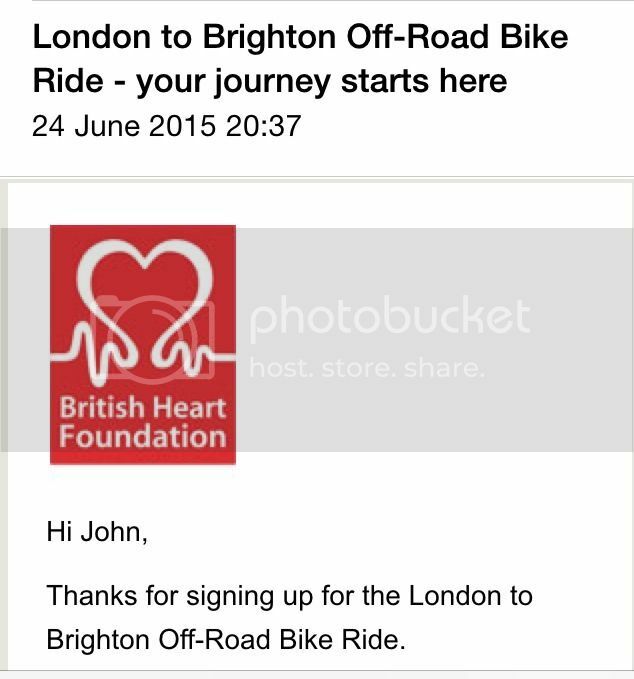 I'm doing the London to Brighton off road this year with 5 mates. You have signed up for a challenge but not an exceedingly tough one. When I did it in 2008 with a similarly untrained/unexperienced mate the first challenge was not getting lost (smartphones with GPS were not mainstream) and the second one was finding food and water, both of which we did not carry enough off. A large part of the route was disused train track converted to cycle path, expect gentle gradients and if the weather is nice many parents with children on wobbly bikes. The first bit along the Thames is narrow, one person who confused this ride with a race only just missed a pole that was put in to keep the cars away. But he did not miss the pothole next to it and scraped off some of his skin and avoided falling into the river by an inch or two. And that was when only 300 people did it, with many more participants there will be more bottlenecks. We did not see many of the others after the first hour (hint: they were not behind us). Night before last was payday so time to put my money where my mouth was! Cheers MBC ... Hopefully I won't need your services but will say hi if I see you.